Awesome VPS company. Ordered a VPS with them last month and the speeds/performance are decent! Howdy there! Thank you for the offers. I have a couple questions. Say I wanted to order two VPS’s, am I eligible to get both of them upgraded to the 1Gbps for free? Also can I use it as a VPN? i wud recommend hostedsimply.. they are providing a gud service for a fair pricing. Support is very fast to answer the tickets..
Hi Syed, thanks for your business! We really appreciate it. Went to orders but was unable to choose the New York location. Any comments anyone if anything else works? Hi Leo, New York is currently available on our SSD Cached plans only. Definitely interested in this service in a New York location, but it isn’t available on the order form. Same, only Los Angeles is selectable when trying to order “Pure SSD – 2GB”. Same, only Los Angeles is selectable. New York is currently available on our SSD Cached plans only. If you require a Pure SSD solution, feel free to order it now in LA, and we will be happy to migrate your Pure SSD VPS from LA to New York once it is available, at no charge. Hi John, we do not at the very moment. Ordered a 2GB VPS – great deal! If i would take 3 servers could you give us another 50% discount on the 2GB Pure RAM ? Hi j0, these plans are already heavily discounted for LEB when compared to what we usually sell them for on our website, so I’m afraid we won’t be able to discount them any further! 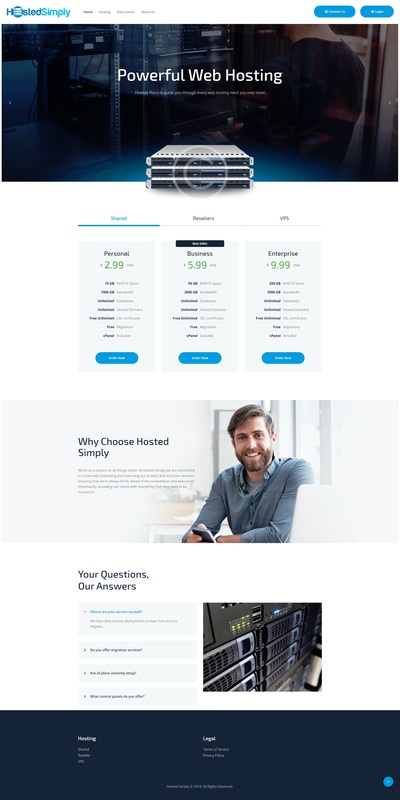 I have ordered my first ever VPS with HostedSimply. The customer service is helpful and reacts quickly and efficiently!